This page contains information on setting up DoneJS. It will walk you through getting prerequisites needed before you ever install DoneJS and includes platform-specific pieces of information not covered in the Quick Start or In Depth guides. This will help you get set up with DoneJS on Windows. To use DoneJS you need a C++ compiler (for native dependencies). First you need a recent version of Node.js. To download Node.js visit https://nodejs.org. There will be two big green buttons for the two recommended downloads. Choose the one on the right, which says Current. This will give you the most recent version of Node.js. Which should then print out the version of Node.js that is installed. In this guide we'll use chocolatey to install packages needed. You don't have to use chocolatey if you don't want, and can instead search for the dependencies and install them with a Windows installer, but we'll use chocolately because it makes things a bit easier. After you've installed chocolatey by following the instructions on the homepage open an administrative console and proceed to the next step. If you plan on using Continuous Deployment with Travis CI, the OpenSSL software is needed to encrypt your CDN API key. 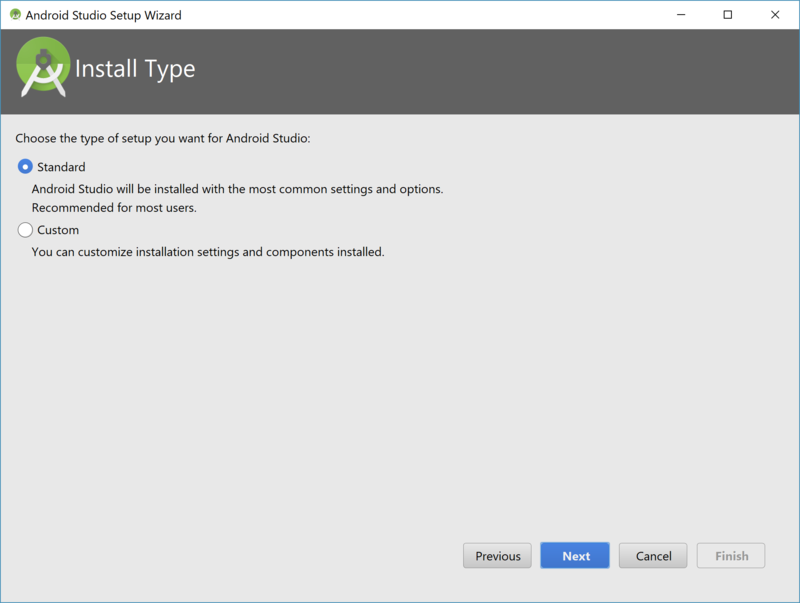 In order to develop an Android application you need to install the Android Studio. The installer will prompt you to also install Java if you don't already have it. Once this is complete you should have everything you need for Android development. You can close Android Studio as you won't need it for DoneJS development. Installing in a Debian / Ubuntu environment takes a little extra work because the version of Node shipped is older than what is supported by DoneJS (and most other Node-based software). This will create an android-sdk-linux folder. At this point you might want to move it somewhere else, $HOME/lib/android-sdk-linux is a good place. Add the android-sdk-linux/tools folder to your PATH with: export PATH="path/to/android-sdk-linux/tools. Add this to your ~/.bashrc or ~/.zshrc config so it will persist. This too should be added to your ~/.bashrc or ~/.zshrc. Click all of these and anything else you need and click Install packages. This starts the Android Virtual Device (AVD) Manager. This is used to manager virtual devices that will run in the emulator. Then click OK to create the device. Close the AVD Manager and you should have everything you need for Android development. First at all, download and install VirtualBox and Vagrant. Once VirtualBox and Vagrant have been installed, you should add the DoneJS box to your Vagrant installation. to see if Vagrant is available in your terminal. Vagrant will ask you for which provider you will adding the box. Choose: Virtualbox Vagrant will now downloading the latest version of the DoneJS development environment. It will take a few minutes, depending on your Internet connection speed. Make sure that C:/www/donejs is a valid directory.